This book. THIS book. THIS BOOK. I'm still at a loss for words, except to say that if you haven't read anything by Jenn Cooksey, your life is incomplete. I know that many will say that those are some fighting' words, but until you read her previous works (the Grab Your Pole series) and Landslide, you can't argue with me. Ok - I found some words. Landslide is nothing like the GYP series, except maybe in that the writing manages to pull you in from the very first word, and doesn't let go of its strangle-hold on you until the very end. At which point you beg the book-gods that your eReader is malfunctioning, and that 100% isn't really 100%. The only thing I knew about this book was the first line of the blurb - For Erica and Cole, the bond of friendship was forged in childhood. The story of these two managed to make me feel the whole gamut of emotions, which I was not prepared for. I liked Cole. Then I hated Cole. Then I REALLY hated Cole. I felt sorry for Erica.Then I hated Erica. Then I felt sorry again for Erica. And then I just wanted Erica and Cole to be the Erica and Cole that the author gave us glimpses of. I won't even go into how Jenn yet again managed to write the most perfect dialogue, laced with just the right amount of humour. I won't go into how she pulled the rug out from underneath me YET AGAIN, with absolutely no warning. The things that I was thinking and what was really going on were worlds apart, and yet I couldn't even imagine the direction it would all go (and trust me, I had some pretty wild ideas!). 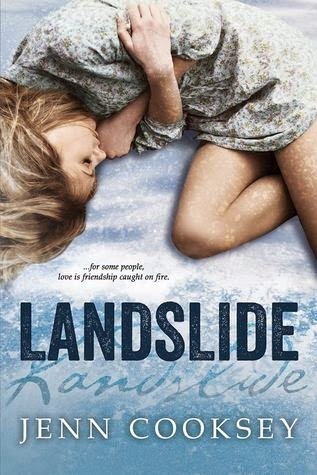 People always ask what authors I wish more people read, and Landslide does nothing but forever cement why I always include Jenn Cooksey in my answer.